On June 2, 2010, CCSS was officially completed and released to the public. One month later, on July 01, 2010, the Louisiana State Board of Elementary and Secondary Education (BESE) recorded in its minutes that BESE adopted CCSS. The Louisiana Register is a monthly publication which provides an access to the certified regulations and legal notices issued by the executive branch of the state government. All of these go through the formal rulemaking process. For four years, this sketchy means of CCSS (and by extension, PARCC) “adoption” remained unquestioned, for the honeymoon was still on, with the governor, BESE, and the Louisiana Department of Education (LDOE) all holding hands as they sat on the same side of the pro-CCSS/PARCC table. I guess that BESE and LDOE never thought they’d see the day that the governor would set himself at odds with the CCSS/PARCC plan for Louisiana. Otherwise, BESE and LDOE might have taken just a smidge more care in making sure that CCSS was adopted and PARCC tests procured according to proper administrative procedure. However, that day did come, and the honeymoon did end on June 18, 2014, the day that Jindal announced his plan to drop PARCC and to cancel Louisiana’s CCSS MOU. The real sting came on that same day with the Division of Administration’s (DOA) Office of Contractual Renewal (OCR) beginning its investigation into BESE’s/LDOE’s procurement of Louisiana assessments– and freezing funding for 2014-15 tests. It’s one thing to know the marriage is over. It’s quite another to have the bank account frozen on the same day. Now, it came as no surprise that both the BESE majority and State Superintendent John White turned their attention to possible legal action against Jindal. However, as of July 22, 2014, BESE and LDOE have not sued, though they have been given the okay to do so by Attorney General Buddy Caldwell. Still, they might have to ask Jindal’s DOA for permission to sue the governor, and that’s just awkward. Frankly, at this point, I think Jindal would give the go-ahead if for no other reason than to be able to have his lawyers subpoena documents from John White’s dysfunctional lair of an LDOE. I want to see White served some subpoenas. I have a birthday coming in a couple of weeks. I would consider such news a real present. Still, no lawsuit from BESE and LDOE yet. But don’t you know, in the past two days, we’ve had two lawsuits on the CCSS/PARCC issue. This is what happens when externally-prompted “state led” goes sour. On July 21, 2014, 17 legislators filed a suit in Louisiana’s 19th Judicial District Court against BESE and LDOE for neglecting to follow proper procedure in adopting CCSS. White and the BESE majority responded with this memo stating that BESE and LDOE do not have to adhere to administrative procedures for CCSS adoption. It seems that Representative Brett Geymann has responded to White’s claims of being “above” administrative procedures. Geymann maintains that BESE/LDOE are not excused from administrative procedure in adopting standards and that previously standards adoption adhered to administrative procedure. (Read Geymann’s point-by-point “facts and clarity” to White here: Geymann to White Facts and Clarity). It seems that District Judge Tim Kelley is assigned to hear the Geymann et al. suit. In December 2012, it was Kelley who ruled Louisiana vouchers unconstitutional. The second lawsuit, filed on July 22, 2014, also in the 19th Judicial District Court, is by a pro-CCSS coalition that includes the charter management group, Choice Foundation. The Black Alliance for Educational Options (BAEO) is paying for this lawsuit. 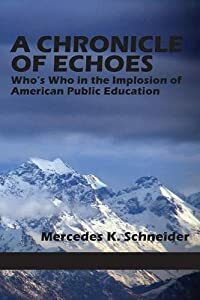 BAEO shares a chapter with Parent Revolution in my book, A Chronicle of Echoes (see pages 321-327). BAEO is well supported by so-called “reformer” cash, including money from Broad, Gates, and Walton, and it promotes the privatization of public education (the “educational options” are vouchers and charters)– and BAEO loves CCSS. Read here for DOA’s Preliminary Review findings on the makeshift job that White offered as his effort to “arrange” Louisiana assessment contracts. So, there we have it: Two lawsuits in two days. School starts in two weeks. Surely that is time for at least another couple of lawsuits to add to the list. And surely we are overdue for at least one counter-suit. No problem. No matter how many CCSS-related lawsuits are filed by August 4th, I will return to school, and I will teach. Yes, we will be there and we will teach! The one comment that drives me bananas is…”but what will teachers and students do when they return it school?!? !” The teachers will teach, and the students will learn. Lawyers bill and our students/teachers/schools pay the price. I note that Amanda Stenson, who testified before BESE and also in a video posted by nola.com. She is the spouse of a service-member assigned to Louisiana, in in her speeches she is usually surrounded by Stand For Children t-shirt-bearing parents? Students? along with CABL’s Stephanie Deselle and LABI’s Brigette Nieland. I wonder if these groups couldn’t find anything from Louisiana to join their little show? Stenson makes a number of claims which have never been supported by any facts, such as the “fact” that her children came from DODDS schools with a curriculum that was “three years ahead of Louisiana’s. Since Louisiana had one of the highest rated set of curricula and standards in place prior to Common Core, I suspect Ms. Stenson has no clue. BAEO is involved as well, so I suspect lots of dollars flowing into local Astro-Turf groups to fund this lawsuit. I do question their standing to sue in this case. Could be interesting. Great job, as usual Mercedes! Thank you! I forgot to say that Amanda Stenson is a plaintiff in the lawsuit by BAEO et al FOR CCSS. I was wondering if your research has gone “up a level”? Do the corporations involved in CCSS and PARCC have international ties? Would you know how I could look into this? You appear to be the FOIA request guru! I’m wondering if charters, prisons, and other remaining ‘public’ entities are being bought out by private corporations in other countries. If this is the case, this country is being eaten away from the inside out. We could be looking at the end of a democratic era as it is slaughtered by corporate greed that provides a segway for American public ownership and political power to transition into the hands of other countries. I’ve been teaching ELA for over 15 years. In education, that’s long enough to say I’ve been around the block a few times. I believe CCSS is just the next bandwagon, so I’m not getting my hackles up over it. I’m not worried about the testing and my salary either. When we first looked at CCSS 2 years ago, my thoughts were…. doing it, doing it, and doing it. I didn’t call it a “close read,” but I was doing it! I’m starting my 2nd year with CCSS and I’m fine with it. My kiddos are high-needs (poor, urban, and ELL for the most part) and they’ve risen to the new standards. It’s text complexity is a challenge, but they’re doing it. I’m not a perfect teacher, but I do believe that having a positive outlook affects student outcome.